Protecting internet history is an important task, so we've taken it upon ourselves to save some of the best stories. 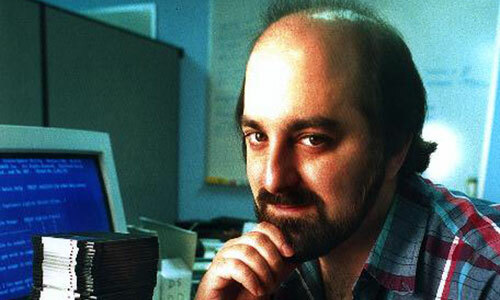 Phil Katz was one of the greatest programmers ever. He built a massively popular compression tool, one so effective that it's a given for computers to support it out of the box in 2015. But the man who created the .zip format had demons no amount of fame or fortune could salve. And in the process, he built up enemies and a string of legal issues that lingered with him for years. Katz's story begins at his mother's kitchen table, a place where he built a PKARC, a program that duplicated the efforts of a popular compression program, ARC, but did things much faster than the existing format. The company that created ARC, SEA, believed his program amounted to theft, so they sued Katz and his budding company, PKWARE. Katz lost the battle—paying a settlement to the company—but won the war. Katz went back to said kitchen table and built a brand new file-compression format that worked even better than ARC. The ensuing program, PKZIP, was distributed for free under a shareware format, and became a massive hit. Eventually, ARC faded into history, a relic of the days when people connected on bulletin boards, and PKWARE became a massive success. But Katz, an archetypical coder in the days before coding was associated with Silicon Valley cool, struggled with his success—and the cracks showed in his personal life. He worked late hours to avoid talking with people, and spent his days living in cheap hotels, avoiding warrants out for his arrest on DUI charges. He frequented strip clubs. With paranoia creeping in and family tensions rising, he fired his own mother from the company she helped manage. His expensive home, which he never visited, became the subject of news articles after neighbors complained about the smell. Soon, the only friends he had were strippers. He was absent from his own company at a time when it was seeing massive success. In 2000, at the age of 37, he died of acute alcoholism. He was alone, in a hotel room, surrounded by empty liquor bottles. His legacy lives on—as does the company that bears his initials—but the story behind his death rarely gets told. ARC creator Thom Henderson, whose professional reputation had been severely damaged by the lawsuit, didn't have much nice to say about Katz, even at the time of his death. "One can only guess what drove him to such a tragic end," Henderson wrote in 2000, "but it is a fitting demise for a man whose professional reputation is based entirely on a lie." If this sounds like the kind of heart-wrenching story that a film should be made about, it's worth noting that the 2005 film BBS: The Documentary touches on this story, along with many other BBS-era tales. But that said, if anyone knows Paul Giamatti, please forward this email to him. Phil Katz's life story deserves an Oscar-winning dramatic film, and he's just the actor to do it. The current number of days, as of this writing, that Usenet's "Eternal September" has been going on, according to Eternal-September.org. The phrase is a reference to the year that AOL opened up Usenet access to its users, turning what had been a controlled situation of newbies showing up on Usenet at the beginning of each school year into something much worse—a never-ending stream of new users who had no idea how to hold an intelligent conversation online. Usenet never recovered. Lotus 1-2-3: The killer software program, which introduced the concept of spreadsheets to millions of business customers, was a huge catalyst for many offices that joined the digital age in the '80s and '90s. But the program couldn't successfully make the jump to Windows, where a new competitor was ready to compete: Microsoft Excel. Excel hasn't supported the Lotus format in more than a decade, and the company's corporate parent, IBM, dropped its support for Lotus back in 2013. Video Toaster: In the early '90s, the NewTek video production platform, which could turn an Amiga into a fully-functional studio for only a few thousand bucks, revolutionized the way that television was made. (Fun fact: Dana Carvey's brother helped make Video Toaster, and said brother was the inspiration for Dana's most famous character, Garth Algar.) Thanks to the Toaster, shows like Babylon 5 were able to create realistic 3D graphics for the fraction of the cost of larger productions. NewTek is still around, as is the 3D graphics platform Lightwave, but the Toaster was retired back in 2009. Napster: Shawn Fanning's claim to fame angered Metallica and indirectly paved the way for Facebook, but file-sharing was simply too hot to handle in the direct-server form that Napster relied on. While the brand name was brought back as a for-profit online music store, this second iteration failed to grab hold, and as of 2011, Napster was sold off to Rhapsody and no longer exists. Fanning's effort, in the end, showed that a teenager with a computer in a dorm room is dangerous. Prodigy: In the battle for the consumer's first taste of the internet, Prodigy was the one that built the best mainstream experience out the gate, but it was America Online that ultimately leveraged that momentum in a major way. Eventually, Prodigy folded; a problem for archivists: The network, which was proprietary, is extremely difficult to rebuild in modern form. Last year, an enthusiast named Jim Carpenter appealed to the public via an Atlantic article for help bringing Prodigy back to life. Here's his progress so far. Aldus PageMaker: It was the piece of software that Guy Kawasaki says "saved Apple," and much like Video Toaster, it helped an industry that once required expensive tools go digital. That industry was desktop publishing. If Aldus hadn't launched PageMaker in 1985, the Mac would have floundered in the business market. But while the Mac survived, PageMaker didn't. The software lost momentum and marketshare to QuarkXpress in the '90s, leading current corporate owner Adobe to start over with a new program called InDesign, the current page-layout standard bearer. These days, the internet's governance is controlled by an non-governmental body called the Internet Corporation for Assigned Names and Numbers (ICANN), which connects the nodes that ensure that the series of tubes are running smoothly. But before there was ICANN, there was Jon Postel. 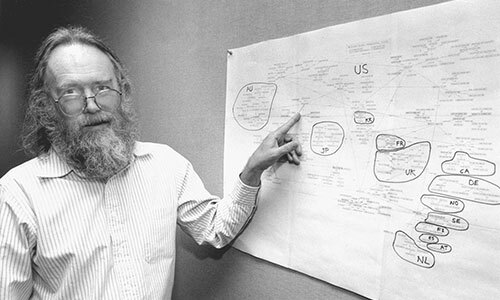 Postel, a computer scientist and University of Southern California researcher who worked with Vinton Cerf and others during the internet's teething years, helped to define the standards and protocols that manage the network today. Furthermore, he was pretty much the overseer of the internet's framework for a number of years, managing the servers and domain registries that keep the 'net humming along. "I was fortunate enough to have been a graduate student in computer science at the time the ARPANET first began, some time ago," Postel explained in Congressional testimony in 1997. "Since then, I have worked on government-sponsored projects in research and development of computer communication protocols and procedures since then." One of the tasks that Postel handled was the management of the protocols and standards that define the internet. Despite the internet's quick growth, he noted that it remained a "side task" to him, eventually being taken on with the help of an organization, the Internet Assigned Numbers Authority (IANA), which went online in 1992. “He was a real network researcher. But at the same time, he felt a lot of responsibility for what was going on with the network [as a whole], and that resulted in him volunteering for stuff that no one else was volunteering for,” John Klensin, another internet pioneer, explained to Wired in 2012. The turning point of Postel's effective ownership of the internet came in early January, 1998—when he finally managed to overstep the bounds of his authority. Postel sent an email to server administrators asking them to point the "root servers" that stored DNS addresses to a computer that wasn't government-owned. They complied, but the move quickly became controversial, and with the federal government breathing down his neck, Postel quickly switched it back. Despite the controversy this move drew, Postel was still going to be offered a leadership role with ICANN, the organization that the government set up to manage the internet. But before Postel could take on his leadership role with ICANN, he died in October 1998 at age 55, having spent most of his life dedicated to the internet's basic function. The timing wasn't particularly great, seeing as ICANN was just getting off the ground, but then again, at least something was in the works before the internet's administrator turned from human to legend. Phil Katz came out of a world of bulletin board systems, and the world of BBSes drove tons of little innovations that can be seen in today's modern internet. Zip files allowed for users to download heavily-compressed files at a time when modems put every byte at a premium. At 2400 baud, it took an hour and a half to download a megabyte of data—so compression was downright essential back in the day. It was a creative solution to the numerous limitations bulletin boards had at the time—things that modern users would never have to worry about these days. Bulletin-board creativity manifested itself in numerous ways, from the ANSI artwork that added visuals without adding much in the way of download time, to the door games that were popular with bulletin-board users.